ScreenshotThe Future Investment Initiative (FII) was hacked on October 22. Hackers targeted the website for the Future Investment Initiative (FII) conference, a major investment conference hosted by Saudi Crown Prince Mohammed bin Salman. 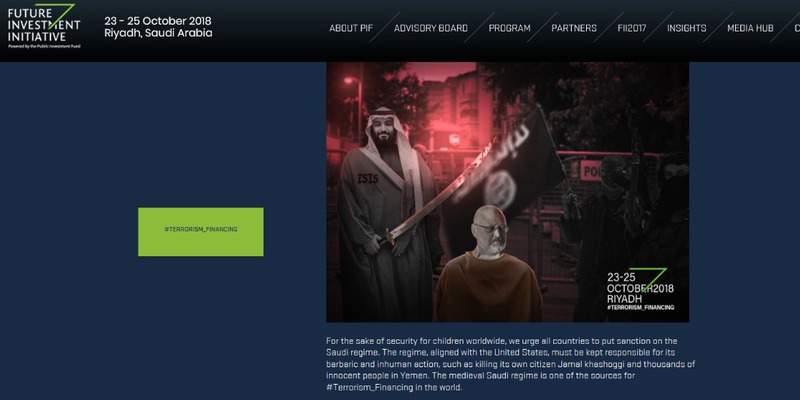 The site briefly featured an edited image of the crown prince holding a knife over the slain journalist Jamal Khashoggi’s head. The images were taken off the site and the page returned to normal on Monday, but appeared to be offline again on Tuesday morning, local time. The conference known by some as “Davos in the Desert” has received negative attention in the wake of Khashoggi’s disappearance and death. Several companies and titans of industry who were previously expected to attend backed out in recent days. The website briefly featured images of the crown prince holding a large knife over Jamal Khashoggi’s head. In the image, which has since been removed, the prince is standing near what appears to be the flag of the Islamic State terror group. The Saudi Consulate in Istanbul, where Khashoggi died on October 2, appeared in the background of the image. The website also linked to a handful of similarly themed YouTube videos. The Future Investment Initiative site returned to normal operation on Monday, but appeared to be offline again Tuesday morning, local time. The conference known by some as “Davos in the Desert” has received negative attention in the wake of Khashoggi’s disappearance and death. Several companies and titans of industry who were previously expected to attend backed out in recent days, including billionaire AOL cofounder and venture capitalist Steve Case and Uber CEO Dara Khosrowshahi, who were both slated to speak. The Kingdom admitted that Khashoggi had been “murdered” inside their consulate, but denied that the crown prince had any prior knowledge of the plot.